A little later than usual due to TuesdayÃ¢â‚¬â„¢s Drake concert, hereÃ¢â‚¬â„¢s my weekly football thoughts. Since I do picks now, I think a little later in the week is okay. As always, a reminder that I am genuinely far from a football expert, but I do enjoy the social constructs of the game. IÃ¢â‚¬â„¢m sure I donÃ¢â‚¬â„¢t have to tell you that winning in sports is the great cure-all, the ultimate social antidote. It really doesnÃ¢â‚¬â„¢t matter what you do, it seems, provided youÃ¢â‚¬â„¢re good at your sport. 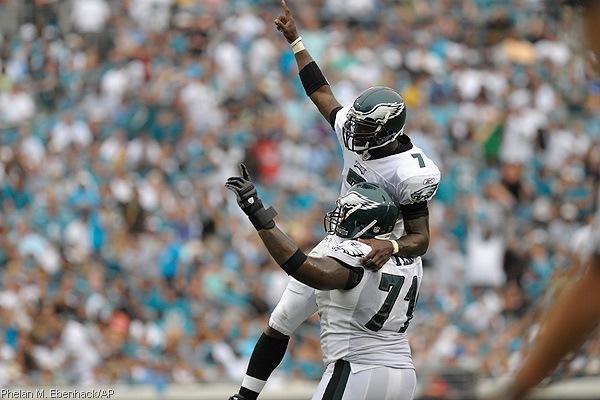 Michael Vick is the epitome of that notion. For a guy universally panned after having done reprehensible things, heÃ¢â‚¬â„¢s sure made a comeback as far as the opinion-shapers in the media are concerned. I read glowing pieces this past week from generally respected journalists like Jemele Hill and Peter King canonizing a guy who as recently as three years ago bred dogs to fight, and thought nothing of killing them if they didnÃ¢â‚¬â„¢t meet his pugilistic standards. To me, there are certain acts that Ã¢â‚¬Å“paying your debt to societyÃ¢â‚¬Â just doesnÃ¢â‚¬â„¢t cover. If youÃ¢â‚¬â„¢re the sort of person that breeds dogs to kill and brutally murders them without remorse, I just donÃ¢â‚¬â„¢t think youÃ¢â‚¬â„¢re ever not that sort of person. ItÃ¢â‚¬â„¢s like this, if someone willfully commits murder against another human being, is there any amount of prison time that makes him no longer a murderer? I understand dogs arenÃ¢â‚¬â„¢t people, but what Vick did is reprehensible all the same. VickÃ¢â‚¬â„¢s keeping his nose clean now, of course. The bizarre shooting of his dogfighting co-defendant at VickÃ¢â‚¬â„¢s birthday party? That was way back in June. And of course Vick went to talk in front of the ASPCA about having righted his wrongs or whatever, he had a career to reclaim. Does he feel bad about what he did? Absolutely, it cost him $100 million, and he lost his two favorite pastimes. But if he hadnÃ¢â‚¬â„¢t been caught? HeÃ¢â‚¬â„¢d probably be staging a dog fight right this second. Now if you read this spot last week, youÃ¢â‚¬â„¢re thinking IÃ¢â‚¬â„¢m a Grade A hypocrite right about now, considering I start Vick in both my fantasy leagues, pigeonholed into that by the rapid end of Kevin KolbÃ¢â‚¬â„¢s tenure as Eagles quarterback. Obviously, I have a vested interest in seeing Vick play well. But I think I can separate his success on the field from the person I still believe him to be. I have to admit IÃ¢â‚¬â„¢ve enjoyed watching Vick rack up fantasy points. And letÃ¢â‚¬â„¢s face it, heÃ¢â‚¬â„¢s always been a wonderful player to watch, and improbably, he seems even better at football than he was before his two years in prison. Yet, I still look at him as someone who was humbled only by the fact that he thought he was untouchable, and then proceeded to get caught. IÃ¢â‚¬â„¢m not of the mindset that Vick shouldnÃ¢â‚¬â„¢t have been able to reclaim his career in the NFL. In that sense, he did the time that his crimes dictated, and you knew someone was going to pick him up and give him the chance to prove that he hasnÃ¢â‚¬â„¢t lost the magic he once had. To me, the only difference between the public perceptions of Mike Vick and Tiger Woods is that VickÃ¢â‚¬â„¢s actually good right now. If Tiger had come back and won his first three tournaments, youÃ¢â‚¬â„¢d have people talking about how heÃ¢â‚¬â„¢s miraculously rediscovered the virtues of monogamy, along with his short game. ThereÃ¢â‚¬â„¢s no question people are mistaking VickÃ¢â‚¬â„¢s work ethic and desire to again become good at football with some sort of newfound maturity.TheyÃ¢â‚¬â„¢re forgetting that he Ã¢â‚¬â€œ IÃ¢â‚¬â„¢ll repeat Ã¢â‚¬â€œ lost $100 million but could still make a ton of money if he convinced people heÃ¢â‚¬â„¢s got his head on straight. Is it any wonder he finally stopped coasting on his God-given physical abilities and actually worked at becoming a better quarterback? ThereÃ¢â‚¬â„¢s also no question Vick will get endorsements again, starting with Nike, who still furnishes him with gear despite the fact that they terminated his contract. DonÃ¢â‚¬â„¢t expect to see another Ã¢â‚¬Å“Michael Vick experienceÃ¢â‚¬Â type campaign; the Swoosh has moved away from pushing individuals in favor of having their athletes promote their Pro Combat line. Vick would actually be a perfect athletic fit next to Adrian Peterson and Chris Johnson in those ads. I donÃ¢â‚¬â„¢t begrudge Vick all of this; itÃ¢â‚¬â„¢s the natural order of things. And if I win my leagues, IÃ¢â‚¬â„¢m not going to look at those championships as blood money. Just donÃ¢â‚¬â„¢t tell me how great it is that heÃ¢â‚¬â„¢s turned his life around when you simply have no idea if thatÃ¢â‚¬â„¢s anything resembling a true statement. The thing is this: If Mike Vick went to the pound tomorrow and adopted a dog, even though heÃ¢â‚¬â„¢s Ã¢â‚¬Å“turned his life aroundÃ¢â‚¬Â or whatever, wouldnÃ¢â‚¬â„¢t you feel a little weird about that? either physically (Jamal Anderson), mentally (Ricky Williams), or both (Larry Johnson). The Titans donÃ¢â‚¬â„¢t have a whole lot else besides Johnson Ã¢â‚¬â€œ Vince Young has 43 throws in three games Ã¢â‚¬â€œ so their main offense has been to slam Johnson up against defenses until they give. JohnsonÃ¢â‚¬â„¢s effectiveness has not dropped; add in an 85-yard touchdown run that was called back in Week 2, and heÃ¢â‚¬â„¢s averaging over 5 yards per carry. But with 84 touches through three games, theyÃ¢â‚¬â„¢re trying to kill him. Johnson doesnÃ¢â‚¬â„¢t get hit square as often as other running backs, but itÃ¢â‚¬â„¢s not like it never happens. WeÃ¢â‚¬â„¢ll see how Fisher handles it, but I suspect weÃ¢â‚¬â„¢ll see Johnson continue to receive a heavy workload since heÃ¢â‚¬â„¢s really all they have. Similarly, with Brett Favre struggling mightily thus far, itÃ¢â‚¬â„¢s worth keeping an eye on Adrian Peterson, whoÃ¢â‚¬â„¢s on pace for 373 carries. I expect Favre to get himself in gear, but right now, the Vikings are leaning heavily on Peterson. And with running backs more combustible and disposable than ever before, itÃ¢â‚¬â„¢s interesting to see little effort being made to preserve the two best singular talents in the league. The big game this week is obviously the Eagles against the Redskins, with Donovan McNabb returning to Philly to be derided by their classless fans. IÃ¢â‚¬â„¢d love to see McNabb will a less-talented Redskins team to victory, but given the thrashing they took from the Rams of all teams in St. Louis last week, I just canÃ¢â‚¬â„¢t see it. I would hope the reception for McNabb is decent considering how excellent he was there, including bringing them to a Super Bowl, but people have short memories. I would imagine 2 1/2 games of Vick has wiped away McNabbÃ¢â‚¬â„¢s accomplishments as far as theyÃ¢â‚¬â„¢re concerned. 1. Colts (2-1) (LW: 3) Ã¢â‚¬â€œ Just try to stop that offense, even with no running game. 2. Steelers (3-0) (LW: 5) Ã¢â‚¬â€œ Strong run game, best defense, Roethlisberger back soon. 3. Falcons (2-1) (LW: 9) Ã¢â‚¬â€œ WeÃ¢â‚¬â„¢ll see how they follow up, they always play Saints tough. 4. Saints (2-1) (LW: 1) Ã¢â‚¬â€œ I still think theyÃ¢â‚¬â„¢re top-notch, but they need to find a way to run it. 5. Packers (2-1) (LW: 2) Ã¢â‚¬â€œ I still think theyÃ¢â‚¬â„¢re top-notch, but they need to find a way to run it. 6. Ravens (2-1) (LW: 6) Ã¢â‚¬â€œ ThatÃ¢â‚¬â„¢s the Flacco I expected, but banged-up Rice for Steelers game. 7. Jets (2-1) (LW: 7) Ã¢â‚¬â€œ Pace, Revis on way back and LT playing with something to prove. 8. Bears (3-0) (LW: NR) Ã¢â‚¬â€œ I just still donÃ¢â‚¬â„¢t think of them as an elite team. TheyÃ¢â‚¬â„¢re good though. 9. Texans (2-1) (LW: 4) Ã¢â‚¬â€œ Take a hit with loss to Ã¢â‚¬ËœBoys. AndreÃ¢â‚¬â„¢s ankle worth watching. 10. 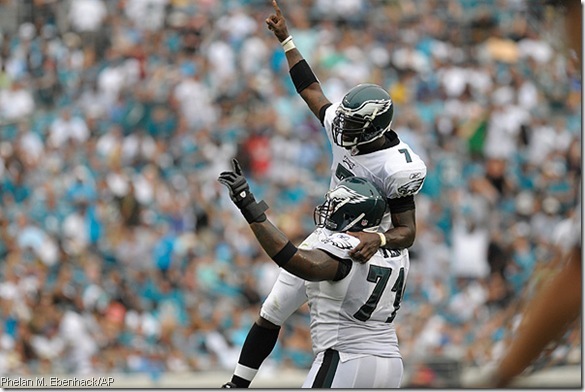 Eagles (2-1) (LW: NR) Ã¢â‚¬â€œ As good a bet as any to win NFC East with Vick rolling. Here are 3 picks for Week 4. Last week: 3-0 (Hit on Bengals, Eagles, Cowboys) Season: 5-1. 1. Saints (-13.5) vs. Panthers Ã¢â‚¬â€œ Take out Atlanta loss on team without a quarterback. 2. Bears (+4) at Giants Ã¢â‚¬â€œ CoughlinÃ¢â‚¬â„¢s crew playing without intensity, and 4 seems a bit much. 3. Jets (-5) at Bills Ã¢â‚¬â€œ I just donÃ¢â‚¬â„¢t think Bills score a whole lot in this one.